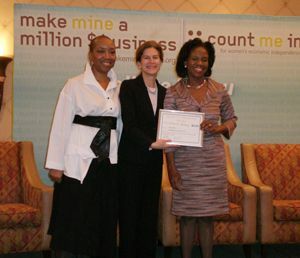 Hinds, a Vincentian, is the President and CEO of Workplace Success Group LLC and was one of four Connecticut, USA, business women who won. Each Micro to Millions awardee will receive an extensive awards package with the following benefits that will help their businesses break through the million-dollar barrier: Inspiration, community, financing and mentoring from a âdreamâ team of coaches and business experts from Count Me In; Up to $5,000 in financing from Count Me In; Discounts on select shipping and office print services from FedEx; Exposure to public relations and marketing opportunities. Make Mine a Million $ Business and Micro to Millions have garnered support from organizations that are all joining hands in order to make an impact in womenâs lives and strengthening the US economy. The impressive list of blue-chip national sponsors includes American Express OPEN, Cisco, FedEx, Jet Blue and Dell. Sponsors provide an array of products and services that serve as invaluable tools for growth. Hindsâ company, Workplace Success Group LLC, works with businesses and educational institutions to train young professionals and youths to be exceptional employees and future business executives. The company also works with business leaders on innovative ways to motivate, develop and supervise this new generation of workers. Some of her clients include Harvard Business School, The Bank of New York Mellon and Turner Construction. In addition to running her company, Karen Hinds is the Vice President of a newly formed Community Foundation for Saint Vincent and the Grenadines. One of the first pilot programmes will be a chefâs training programme that will be conducted in collaboration with facilitators from culinary programmes based in the USA and the Caribbean. âI believe this Foundation has the opportunity to improve the lives of everyone in our community, and Iâm very excited about the opportunity to serve, and it gives me a wonderful chance to personally give backâ, said Karen recently. âI am excited about this new chapter in my business and look forward to expanding my horizons with this business award knowing that God has given me this opportunity so that as I grow, I am able to bring others along with me,â Hinds said.